If the ministry that brought condemnation was glorious, how much more glorious is the ministry that brings righteousness! 2 Corinthians 3:9 (NLT) What would it look like for you to be bold, transparent, free, and truly the person God created you to be? What would it look like for you to BE YOU? In this four week mini Bible Study journey with author Heather Bixler as she shares some of her personal struggles with you in an effort to be transparent with you, the reader. God wants us to shine and radiate His glory, but truly this can only be done through our brokenness. God is looking for transparent women to help guide others to a true and intimate relationship with Jesus through the sharing of their own brokenness, and compassion for one another. If we are truly going to shine for HIS glory in the new ministry of HIS righteousness then we must learn the art of being who God created us to be. We often think this is found through performance and behavior changes, but when we have given our life over to Jesus then everything God created us to be is found in the Holy Spirit that is already living within us. Come and unwrap the beauty that is already within through the four week mini Bible Study, Be You! Download on Kindle today for Only $0.99! BONUS: Breaking Pride - Tearing Down Walls, Walking in His Grace. 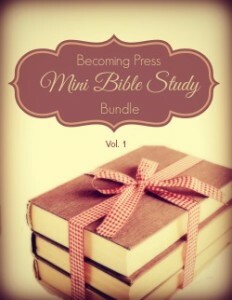 Download the Becoming Press Mini Bible Study Bundle- Vol. 1 for free today and tomorrow (11/29 & 11/30)! 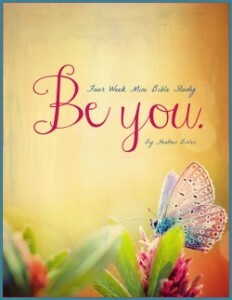 Free Online Bible Study using the "Be You - Four Week Mini Bible Study! Sign up today for a free four week online Bible Study with author Heather Bixler. Starting in January 2014 you will have the chance to participate in an online Bible Study of "Be You - Four Week Mini Bible Study." Be sure and sign up today, space is limited and registration is required! Sign up for the FREE online Bible Study here! Still time to enter our giveaway. Just submit your entries using the rafflecopter widget below: a Rafflecopter giveaway This is a Becoming Press LLC book launch. Sign up here to become a book launch blogger!